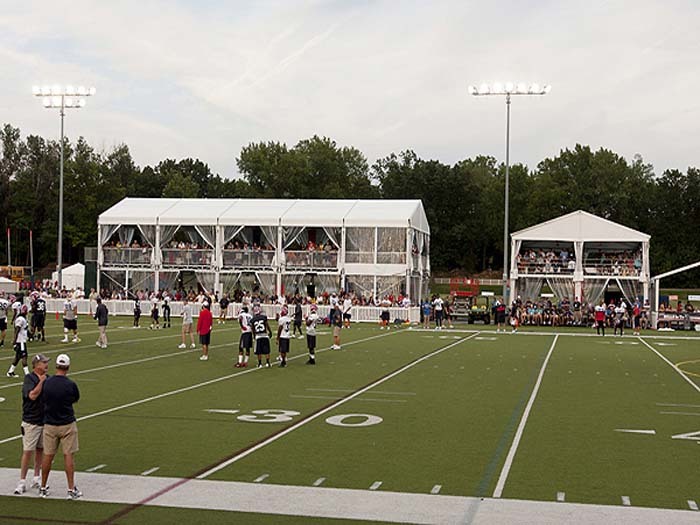 With the Rio de Janeiro Games recently coming to a close, and sports fans in the U.S. turning their attention to pre-season football, it seems fitting to highlight the double decker structure and VIP area we built specially for an NFL training camp. 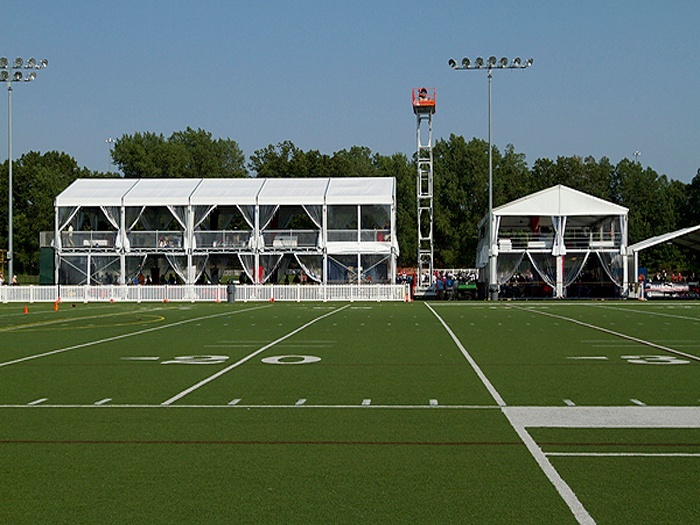 For the training camp, Mahaffey designed a two-story viewing area for VIPs that had the best views in the house, and included aluminum stairs and railing on both structures and sides that were covered with clear fabric for continuous viewing, even during the rain. Double Decker structures are popular for sporting events, since the second floor offers a great vantage point for watching the action on the field. They’re modular by design and can be installed in a variety of configurations, shapes, and sizes. The footprint of the upper level can mirror the lower level, or a smaller structure can be constructed on the upper level in order to create an outdoor lounge or balcony area. In addition, modules can be eliminated on the ground floor to create open gallery areas. While double deckers are popular for bigger events, over the years, we’ve also worked to construct a variety of custom, temporary sports facilities across the country. We even constructed a temporary holding facility for baggage at the 1988 Winter Olympic Games in Calgary. Custom Pool Cover for All Seasons – In the winter, pools become practically obsolete. 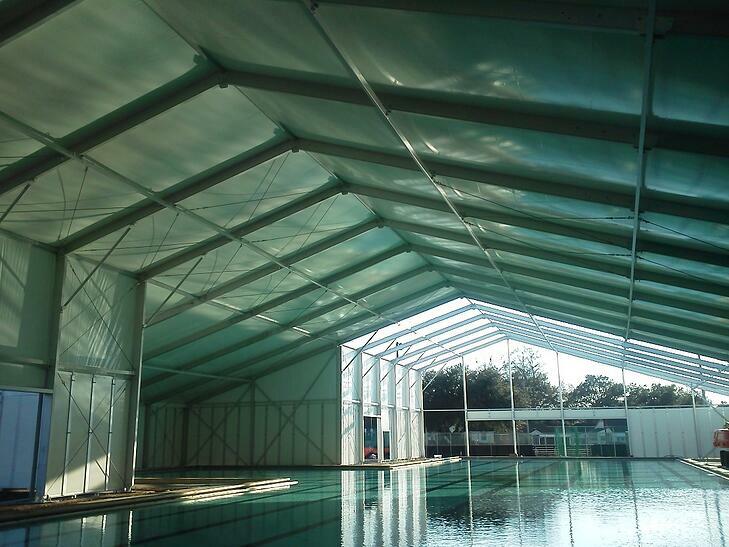 By creating a customized pool cover, we were able to provide an insulated option that allowed guests to swim despite unfavorable weather conditions. Every piece of the structure was custom made, and the final product was a T-shaped structure equipped with personnel doors, vent fans, special indirect sports facility wide lighting, and insulated top and side walls. Seasonal Structures for a Temporary Ice Rink – When you live in the Southeastern U.S., ice skating isn’t widely available unless you happen to have a permanent rink in your city. For several years, the Memphis Zoo has used Mahaffey to provide a temporary ice skating rink during the holiday season. Our seasonal structures - equipped with air conditioning in hot climates, lighting systems, sprinkler systems, and any other equipment commonly used in a brick & motor building - make it possible to offer a temporary ice skating rink in warmer climates, where an open air rink isn’t a possibility. Wegmans LPGA Golf Tournament – In order to design pristine and elegant structures with innovative features for this elite event benefitting disabled children and inner city youth, our nine-man crew spent almost three weeks working to achieve the custom look that the client was seeking. 206 clear glass window panels gave spectators a perfect view of the grounds, and double glass doors complemented the window panels. Eleven 28-light chandeliers with dimmer switches were installed to add elegance, but clear gable ends also allowed natural lighting to be viewed from inside the tent. The end result was a temporary structure that felt like a permanent part of the clubhouse, allowing guests, media, and players alike to enjoy the ambiance of relaxed elegance and comfort. Sporting structures are not Mahaffey’s only specialty. We provide portable structures for many industries. From aviation to industrial projects to special events, Mahaffey Fabric Structures can provide a solution designed specifically for you. Want to learn more about the types of portable structures we provide? Contact us today.